With Nagato sensei we covered the end of the Takagi Yōshin ryû Moguri Gata and then we began the first level of the Shinden Fudô ryû. But somehow it was like continuing with the same fighting system. 潜り込む, Moguri komi, has the meaning of “to conceal oneself” (but in plain sight). In fact you are moving in a way that cannot let the opponent know exactly what is going to happen next. When we moved to the Shinden fudô ryû waza, the same Moguri feeling was there too. This was another example of kehai wo yomenai. Reflecting on that, I thought I would give a try on how to understand the bujinkan system from a global point of view. The Japanese use an expression 武芸百般, Bugei Hyappan, which means “all the martial arts”. And to me the last kanji “般” is the key as it means “all” but also “to carry”. The way I see it, is that each martial fighting system is contained (carried) in any other. Therefore we understand that the idea behind Bugei Hyappan is that all fighting systems are the same or, at least, are all linked (cf. the Moguri feeling in the Shinden fudô ryû techniques. Our Bujinkan system regroups 9 fighting systems that we call “schools” but it would maybe be more accurate to name them “armies”. The samurai of one clan were learning only one system and they had no clue about the other systems they were fighting. This is the same in modern warfare. All armies fight more or less in the same way, but a soldier from one country doesn’t train in another army. A French soldier will not follow the training of the Russian, British, or American army. Soldiers today know only one fighting system, the one from their country. That was the same in Japan before unification. So when we train Bujinkan, we must keep in mind that during the Muromachi and Azuchi Momoyama periods, the soldiers were fighting with only one system in a given army (apart from the regrouping of the Koto/Gyokko, and the Takagi/kukishin that happened in the course of time). In those days, unification wasn’t carried out yet (it will be done in 1603 with Tokugawa Ieyasu). And each Daimyô trying to expand his own territory had a “master of arms” training his troops. The techniques had to deal with the same situation (battlefield, horses), the same type of equipment (Yoroi, weapons), and all of them were fighting humans (2 arms, 2 legs). The only difference was the terrain on which, and for which they developed their skills. When Nobunaga Nobuo (son of the Shogun) went to the mountains of Iga to force the Iga community to join the unification carried out by his father, he was easily defeated. The mountain skills of the Nobunaga soldiers were no match compared to those of the men of Iga. But if each ryû developed a specific type of warfare due to the geography of their surroundings they had to solve the same issues when facing a one to one combat. This is why many techniques are quite similar in the ryûha. Yesterday Nagato sensei explained that Fûbi from Shinden Fudô ryû was very similar to Hitō of the koto ryû. This is the reason. Once you have accepted that despite geographical locations the samurai had to deal with humans, it is quite obvious that there is a common base to every fighting system. This common element is the human, Jin. Therefore when you adjust the Jin to the surroundings Ten (weather conditions), and the Chi (terrain) every system is contained in each ryû. This is the Bugei Hyappan. This is why Hatsumi sensei, in my opinion, designed the tenchijin program in order to give us a common platform to learn the ryûha. This is what we call the basics. This is the bujinkan boot camp. Nagato sensei taught us yesterday Nichi Geki, the first technique of Shinden fudô ryû. The kaname (key point) is Koshi Kudaki which is found in the Chi Ryaku no Maki/Aite to Kumu Kokoro Gamae (aka Hajutsu Kyû Hō). Once you know the tenchijin (basic platform), it is easy to learn the different ryûha and to understand the specific aspects of each fighting system. 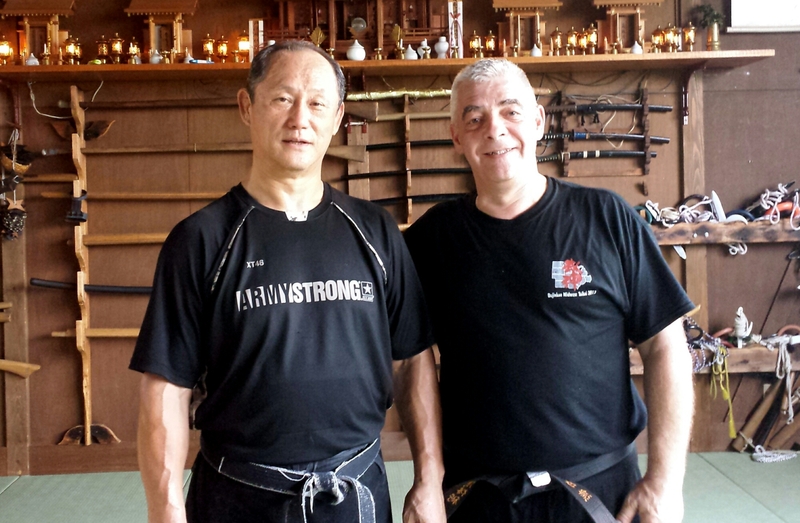 Whether you like it or not, the bujinkan system is a military system by essence. Each ryû is an army. The techniques are designed to be taught to 10-year old kids (samurai were 15-year old when allowed to go in battle). And because we have the chance to learn 9 different fighting systems, we can see that they are all connected. The bujinkan truly is teaching Bugei Hyappan. As sensei puts it: “when you train a specific ryûha, all the trainings you have done in all the other ryû are influencing your understanding of a technique”. This is why it is important to train with all the Shihan and to understand that each one of them being different, the same technique will never be the same. And this is why the bujinkan is complete.